You’ve got to tip your hat to the lads in Beatallica. 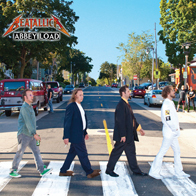 Few would have thought to merge together two of the most successful acts of their respective genres – pop tunesmiths the Beatles and thrash metal bashers Metallica – and create a must-hear, creative blend of both iconic artists. And the band that contains such wittily named band members as Jaymz Lennfield, Kliff McBurtney, Ringo Larz, and Grg III are back with their third full-length overall, ‘Abbey Load,’ via Oglio Records.